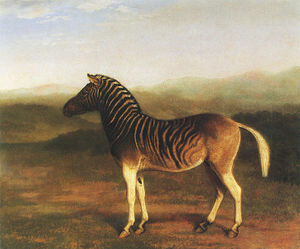 The Stripeless Zebra (Equus nonclavatus, "horse without stripes") rarest of tamable monsters resembling zebras, but without stripes. 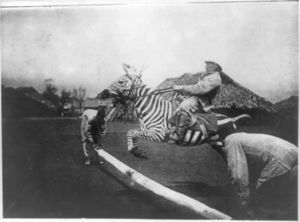 Of course, the normal zebras seen throughout the land, pulling carts and being ridden by humans, have stripes. 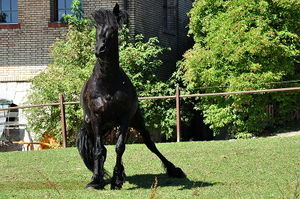 Most people will agree it is ludicrous to imagine an equine otherwise. However, they do exist, and because of this rarity the stripeless zebra is often shunned and mocked as a freak of nature. What is not commonly known about our everyday domestic zebras is that they are not, as they appear, white animals with black markings. In fact scientific evidence shows that the zebra is black at base and the white stripes and belly are the markings. Because of this, a zebra born without markings is black, not white. A hero may tame one of these animals for their rarity. 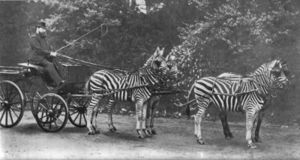 Some enterprising souls attempt to exhibit their stripeless zebras to raise beer money. 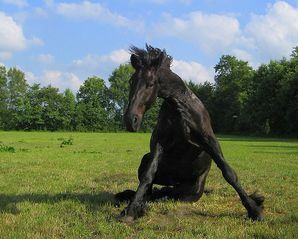 Learn more about your pet by taking a look at the Pet Names and Pet Personalities pages. You may take a ride on your pet.